Left, a stock 2018 Chevrolet Colorado has smaller wheels and low ground clearance. Right, the Colorado ZR2 Edition features a 3.5-inch wider track and a suspension lifted by 2 inches. Maybe you’ve seen a truck like yours driving around town, but somehow it just looks better than yours. Why? The answer may be found in larger tires and maybe a leveling kit or a full suspension lift kit. You love your truck, but you want to make it distinctive from the others that look just like it. A more aggressive off-road, rock crawler or Baja Pre-runner look will make it stand out! Mounting larger-than-stock tires is one of the first and best ways to customize your truck. Larger tires used to be for off-road use or the specialty of gearheads. These days you’ll see trucks and Jeeps with oversized tires and lift kits around the grocery store parking lot. Tires are essential to your truck’s performance and safety. After all, the rubber literally meets the road here. Before you take the leap, let’s look at a few things to consider before you put larger tires on your truck. A larger tire size can make your truck look and perform better in some situations. But changing tire size too much can affect speedometer and odometer accuracy, handling, steering response as well as safety issues such as tire load capacity. Before you start modifying your truck, it helps to have a plan so you can take the proper steps. You don’t want to put a leveling kit on your truck only to realize later you’d rather have a full suspension upgrade. Depending on the height increase you’re looking for, a suspension upgrade will include new springs and shocks along with brackets and shackles. If you go really big you’ll need to change drive shafts and brakes among other things, and don’t forget to add a step to climb into the taller truck! Start with tire sizes. The sidewall holds a lot of information once you can decipher the three-number code. 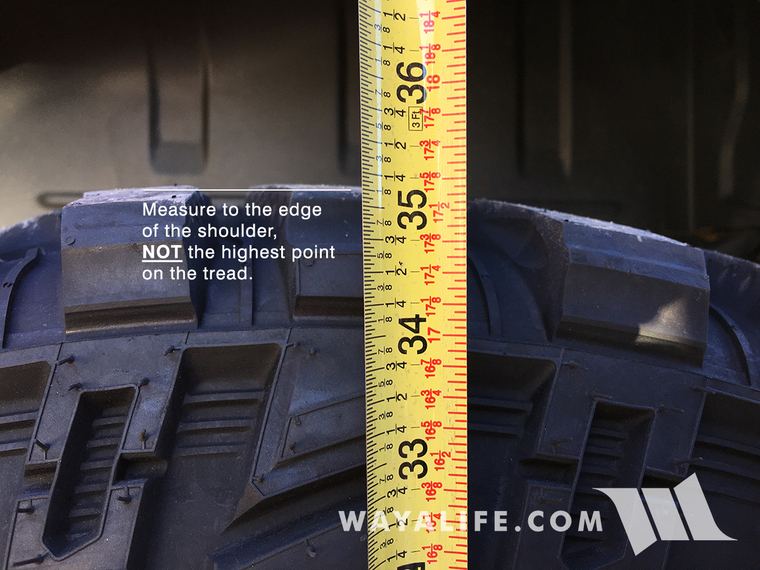 Here’s more about reading off-road tire sidewalls. Tire sizes are expressed in a common format: 235/75R15. 15 = wheel diameter (in inches) that a tire fits. Truck tires may also have the designation LT for Light truck along with the tire size. To find the standing height or outside diameter you need to measure the tire. You’ll find the OD or overall tire diameter in the specs for every tire we sell. Determine the stock OD and how much taller and wider you can go depending on the suspension modifications you’re going to make. Use the resources at TireSize.com and the wheel/tire calculator at Ready Lift to find the right wheel/tire/combo for your truck. Keep in mind the speedometer, odometer, traction control, torque, and gearing are all based on the distance the tire travels during one complete revolution. This is based on the outside diameter of the tire-and-wheel combo. If the change in the diameter of the tire is large enough, the speedometer will be inaccurate, it will indicate a speed slower than your actual speed. If you change the diameter of your tires drastically, you could change all these settings and impair the performance and safety of your truck if you don’t modify other components accordingly. That’s where having a plan makes life simpler. Consult with a qualified tire installer to help develop a plan based on your vehicle and goals. To fit bigger tires, you may need to lift your truck. There two basic levels of lift: a leveling kit and full suspension lift. A leveling kit is the most popular as it’s the most economical way to gain clearance for larger tires. Most light trucks and full size SUVs have what’s known as a “factory rake” or “stance.” This is when the front of the vehicle is lower than the rear. Why do they do this? When you have a heavy load in the truck bed or are towing, the rear of the vehicle will squat down, making the vehicle level in stance, instead of the rear being dramatically lower. Most truck and SUV users rarely have this type of load or towing conditions and prefer a level stance of their vehicle. So this is where a leveling kit can come into play. It adds a spacer on top of the front spring or strut. These spacers range from 1" to 2.5" in thickness to achieve the desired front lift to effectively level the vehicle. Nothing is modified for the rear suspension as a driver would just want to level the stance. With the newly leveled stance, you can typically increase the tire diameter by 1.0" – 2.0". Check with the leveling kit manufacturer for recommended tire diameter and needed wheel width and offset for proper fitment. Additional fender, bumper or suspension modifications may be needed depending on the vehicle and amount of lift. At the minimum, an alignment must be done after the kit is installed. Again, this where a plan (and talking to an expert) comes in handy. Even if your new tire and wheel package doesn’t need it, a leveling kit sets your truck apart. With a leveling kit you can add some add some lift without breaking your budget. Depending on your vehicle and the lift height, a kit will run a few hundred dollars to close to $1,000. A leveling kit includes spacers and fittings that lift the bed and cab above the original suspension, which stays in place. Your truck will have more ground clearance and will ensure larger wheels don’t rub the fender wells. The maximum lift is usually three inches. Look for a proven wheel-and-tire combo specifically designed for your vehicle. Check out our truck tire Smart Guide to get started. And work with your local TireBuyer.com installer to come up with a plan for your truck.